In November of 1940, during a time that fans and historians dub “The Golden Age of Comics”, Timely Comics—the forerunner of our well-beloved and timeless Marvel Comics—introduced a new character created by the writer-artist team of Joe Simon and Jack Kirby in Marvel Mystery Comics #13. This character was an alien officer of the law who could fly, wield cold and ice, teleport, and create illusions to confuse his enemies—he was called Aarkus, or “The Vision”. Several decades later, as Marvel rose to take its place on the comics landscape, Stan Lee and writer Roy Thomas wanted to add a new member to The Avengers, their premiere team of superheroes. At first, Thomas meant to reintroduce the Golden Age Vision, but Lee had other ideas. Together they created an almost altogether new character that they debuted in The Avengers # 57: an android hero swathed in red, green and gold, strong, fast, intelligent, who could alter the density of his own biology to fly and pass through objects, and was gifted with a solar gem in his forehead that granted him unparalleled firepower. It was this hero that Marvel fans have come to know as Vision. Fast forward to the present day. May 2015, Avengers: Age of Ultron roars into theaters across the globe, and Marvel fans witness the onscreen birth of one of their favourite heroes as Vision once again rises to claim his place in the Avengers. To be perfectly honest, I always liked Vision, but I wouldn’t have ranked him among my favourite Marvel characters. It wasn’t until he exploded out of Helen Cho’s Regeneration Cradle that he rocketed up the list into my top five. I’m a professed, passionate Marvelite; ask anyone who knows me, they’ll tell you it’s true. With the exception of Guardians of the Galaxy (which I love but have torn feelings over, but that’s a story for another time), as they have been released, every Marvel movie has become my new favourite. And Age of Ultron was no exception. I watched—enraptured, with shining eyes and clasped hands as Vision took his first steps on air and earth, and with words that rallied his fellow Avengers he showed the pure, noble heart that beat in his vibranium breast, and I realized that I had a new favourite Marvel hero. Sorry, I tend to ramble when I’m fangirling. Here’s a list of five reasons to love Vision now. 1. First off, he’s stronger and more human physically than he’s ever been before. In the comics, Vision was android, created by Ultron to be a robot with the appearance of a human, with a metal skeleton and synthetic skin. Thanks to Helen Cho and her Regeneration Cradle, Vision is much closer in biological structure to a human, and a more accurate descriptor of him would be “synthezoid”, as his body is comprised of synthetic human tissue cells bound and fused with vibranium. Yes, the same metal as Cap’s shield. That’s another thing: Vision was made of ordinary metal before. Sure, strong metal—Ultron would have made sure of that—but all the same, commonplace metal. But now, thanks to Joss Whedon and his compatriots, Vision is now a child of the strongest metal on planet Earth. How’s that for strong? 2. Everything that makes him unique now has solid, traceable background. In the comics, in the beginning, Vision’s very unusual, very unique features—on paper—would have looked like they were cobbled together willy-nilly from Stan Lee’s personal wishlist of superpowers and super-artifacts. 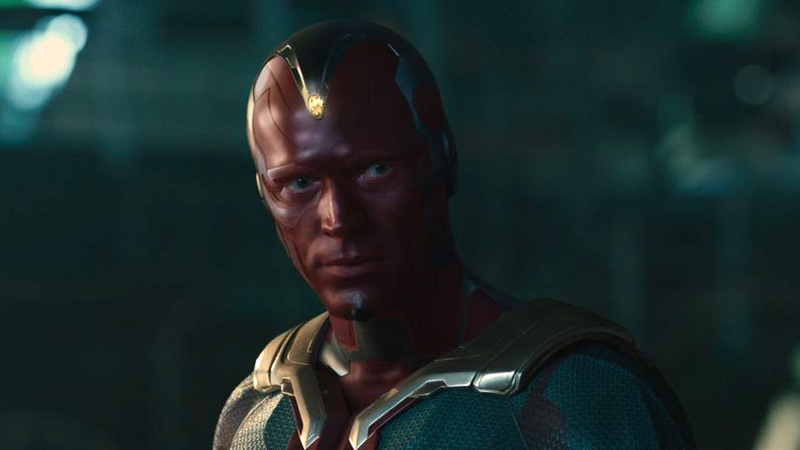 But in Age of Ultron, all of Vision’s features can now be traced somewhere. The solar gem in his forehead has now become one of the mighty, mysterious Infinity Stones, the Mind Stone, no less; one of the most powerful and dangerous Stones, especially in the wrong hands. (Still not sure you’re not in that category, Tony, sorry…) Heck, the campy (no offense, Stan) 80’s-style yellow cape, gloves and boots have become a gorgeous Asgardian-style set of golden cloak and crimson boots and gauntlets, as if when he formed them Vision was acknowledging Thor’s hand in his creation…and overall Asgardian badassery. And of course, Vision’s unparalleled gifts with technology and the internet come from his previous existence as our favourite UI and the Stark Industries kingpin, JARVIS. And what with that familiar voice and British lilt, how could we forget such origins? (Sigh.) I love Vision, now more than ever, but a small part of me will always miss JARVIS. 3. His personality has gone from 2D to breathing, sparkling 3D. I’ve read quite a lot of Marvel Comics, and while Vision is still as noble and good now as he was then, he’s never thrown out the occasional snarky or sarcastic one-liner. Thanks to JARVIS’s wry, dry humor and all that cracking wise that ultimately comes from Paul Bettany, Vision would probably be able to go toe-to-toe with Tony Stark in an all-out Battle of Wits, Snark Edition…and who knows who’d come out on top? 4. His megalomaniac family of one (Ultron) has just jumped up to five. When he first appeared, Vision’s sole creator was Ultron. (Shudder.) But now he has not one, not two, but five parents! Who’d a’ thunk that?!? Ultron, obviously, he owes the design of and the vibranium in his body. Helen Cho and her masterpiece of science, the Regeneration Cradle, provided the synthetic tissue cells and fused him together. Tony Stark and Bruce Banner are responsible for uploading JARVIS into his newly-formed brain. (Can I get a woot-woot for the Science Bros as parents?) And last, but certainly not least, Thor provided the last mighty boost of Mjolnir-generated lightning to propel him into life. Whew. Who doesn’t envy Vision his big, crazy, genius family?!? 5. Oh, and speaking of Mjolnir...he can lift it. Those are the words graven with magic into the side of Mjolnir in the comics, and with one exception, that is what they have always said. The number of people who have been deemed “worthy” can be counted almost entirely on one hand: Odin, Thor’s grandfather Bor, Beta Ray Bill (a Korbinite who is essentially their race’s Thor), Steve Rogers (when Thor was down for the count), Loki (when Wanda Maximoff and Doctor Doom hit him with a reversal spell that turned him good for awhile), and lastly, Jane Foster, the new Thor. Who among us did not gasp or laugh when Vision casually picked up Mjolnir and handed it to Thor, given the other Avengers’ efforts to lift it earlier in the movie? Joss, you may have done plenty of things in Age of Ultron that not all of us might be happy with, but the one thing we can all agree that you did absolutely right was that you made the purest heart, the most wide-eyed soul worthy. I am a very biased Marvel fan, especially when it comes to my babies, and I will defend them with passion and fervor at least equal to any of my fellow fangirls. Vision has always been one of Marvel’s best and most unique characters, and in my opinion he’s deserving of much more love than he’s gotten. I hope that for those who don’t already love Vision for the pure-hearted, humanity-seeking synthezoid he is, this article might help change that. —Vision, Avengers: Earth’s Mightiest Heroes, 2010-2013.